This morning at 10:00 we met at school for one last time. 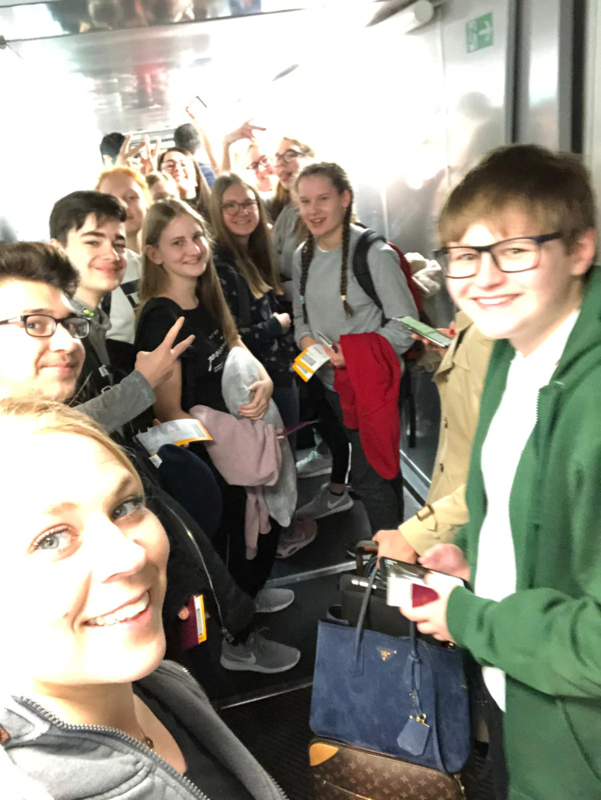 After thanking for the great time and saying goodbye to our host families we also had to say “see you soon” to each other. 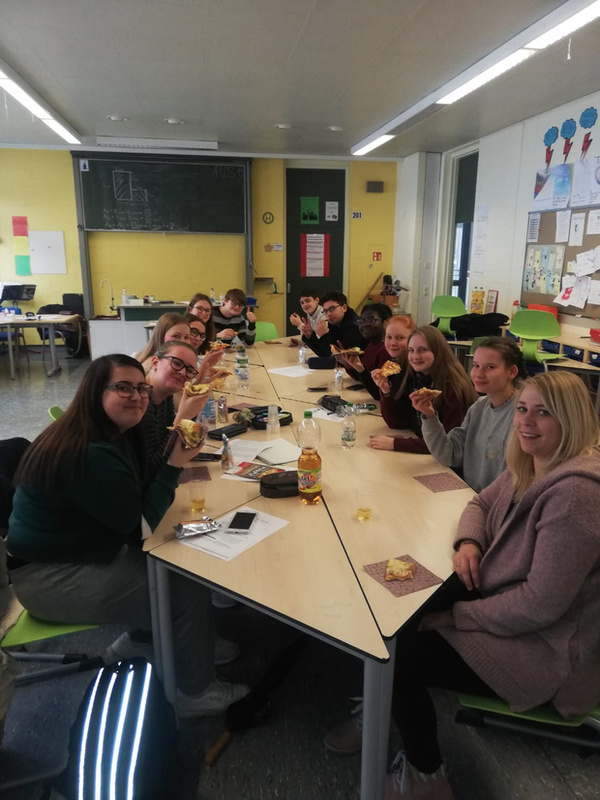 In our last meeting we talked about the week, what we liked, what we were afraid of before meeting, what we learned and our conclusions. We all had a great time with a lot of fun and found new friends in this very special week. For some of us it maybe was one of the best weeks in life. It was a great experience for all of us. It was a special atmosphere between crying a lot, laughing much more, singing, having fun and very touching statements. We miss each other so much. As we had to leave and got separated at the airport tears were running like waterfalls. But we are all closed in our hearts. We are all really looking forward seeing again in Germany in round about six weeks. The real last full day in Israel was again a free day because it was the election day. So there was no school and we had a day in the families. Most of us went to the beach again and met there. It was a really hot day with over 30°C so many of us swam in the sea during enjoying the sun. It was so much fun. 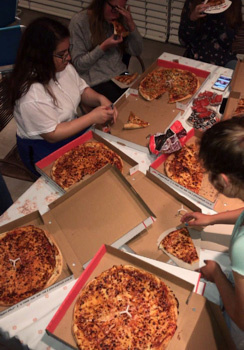 In the evening we met at Shahar’s house and ordered very delicious pizza to celebrate our last evening in Israel. This morning we stayed at school. Maybe that sounds boring, but it wasn’t! First we went to the beach and surfed on big boards for 12 people. Everyone had a lot of fun. We did a race and tried to get the others off the board into the water. Later nearly all of us landed in the water. That was great fun! After having a shower we went to the centre for marine studies and agriculture. It is right next to the school for water sports. We learned a lot about sustainability in the oceans and about the reproduction of clownfishes (Nemos) and seahorses. There also is a turtle rescue station. In the afternoon Yuval (one of the Israeli exchange students) showed some juggling and taught us how to do it. We practised very hard and had a lot of fun and many curios situations. We also played some sport games on the schoolyard. After lunch we created and painted a “flag” for the boat, which the exchange students two years ago colored. 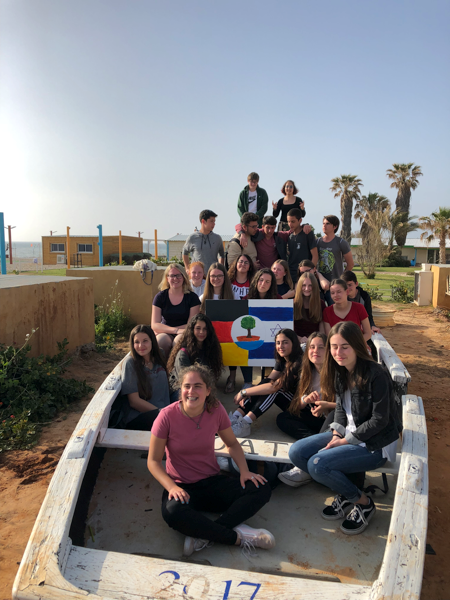 We decided to combine the flag of Germany and Israel and put a new sign in the middle which represents the two schools (a boat for Israel and a tree as its sail for Germany). Everyone, buckle your seatbelts and call you Sally! Todays day report comes from July Eastside, also known as Julian Lasota and Lavi Bashan. Today we went to Jerusalem. It was very special. 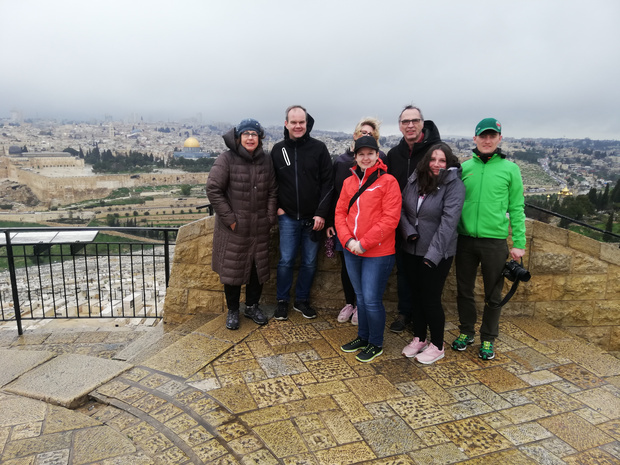 At first we went to a vantage point from where we had a fantastic view over the whole city of Jerusalem and the area of the ancient city, where a lot of important things happened which made Jerusalem become a holy place for the three big religions. The Jews, the Christians and the Muslims have their roots in Jerusalem. We talked about Abraham who is an important person for all of us and about Jesus and Mohammed. After that our group went to the ancient city were we continued the tour with our guide Daniel. The highlight today was the western wall (Klagemauer) and the big old market called Yehuda Market were we also ate lunch. After our trip to Jerusalem we joined the programm of the sports- and healthweek at school. Every student and the parents of grade 9 could choose two out of nine sports. I (Karolina) did workouts and running along the beach. I (Yuval) played volleyball and dodgeball. After these activities there was a buffet with healthy drinks and food. We ate bread and a lot of yoghurts while we drank water. It is a great project and we had much fun. Today was a free day in the families. We all met on the beach and had a great time together. Unfortunately it was cloudy but it was fun anyway. We played volleyball and other team sports. Nearly every German student has sunburn. In the evening all students and the teachers went out for bowling and having fun. It was really a nice and funny Shabbat. On Friday we went to Tel Aviv. It is a wonderful city. We ate a lot of very very good food there.The German students tried “frozen yoghurt” and valued it as the best one they ever had. For lunch we had burgers at SoSo. The best burgers of the world because the meat was very delicious and even the cheese was creamy and tasty. 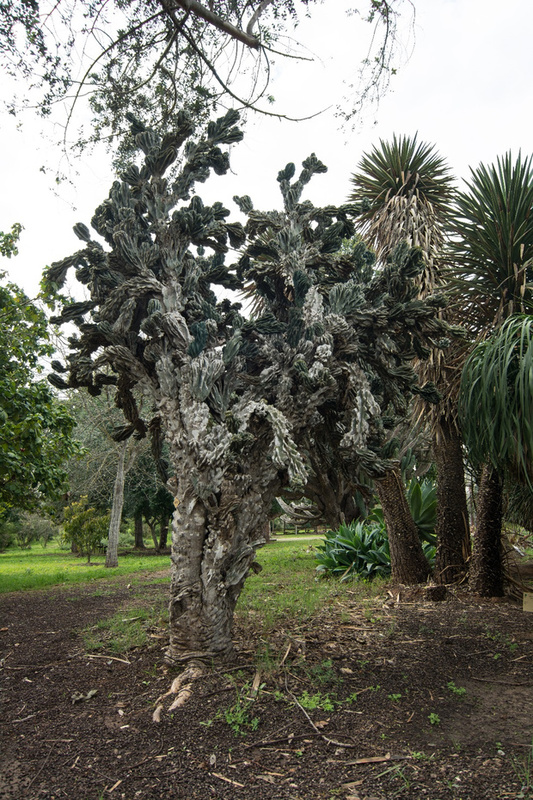 In the morning we went to Kibbutz “Maabarot”. 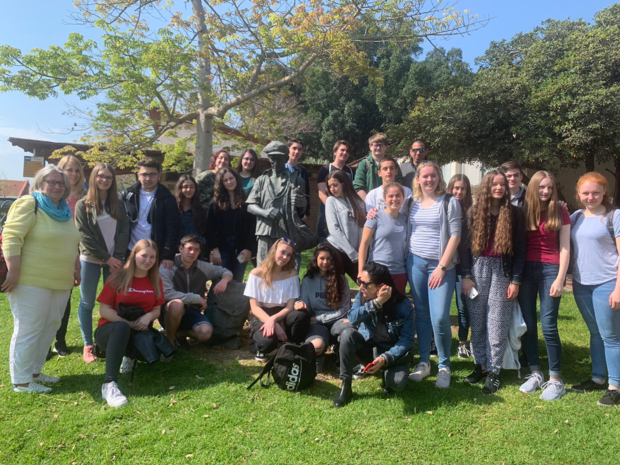 After getting to know what a Kibbutz is and how it was developed we met a very special person named “Jacob”, listened to his impressive testimonial and had a very interesting conversation about his life. Later we went to a Museum and Place of Recollection called “Beit Terezin” in the Kibbutz “Givat Haim” where we collected fascinating experiences. We learned a lot of things about the Ghetto Theresienstadt/Terezin and living there especially as a child. The best thing of all was that we made groups, which was good for all of us to get to know each other better. As we worked together, we now don’t just know our partners. We all understand each other. To have a good time and to spend a nice week together the most important thing is to know and understand each other and have fun. After a long day of travelling by bus (Burbach – Frankfurt) an by plane (Frankfurt-Vienna-Tel Aviv) we arrived. We were all really tired but also excited. After we went through the security we saw the Israeli students with big smiles and excitement on the faces. As soon we noticed each other the girls ran towards each other and started kissing while the boys just shook hands. After that great welcoming we went to the bus. There we got nice welcoming gifts with typical Israeli sweets. We listened to music and the atmosphere was pleasant lively. 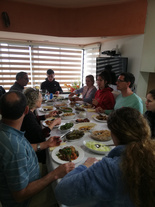 After arriving at the Ramot Yam School we all went to our host families. 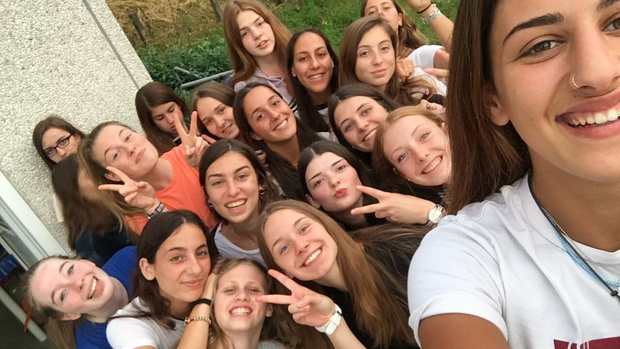 Preparatory weekend for the upcoming exchange ! Hi! 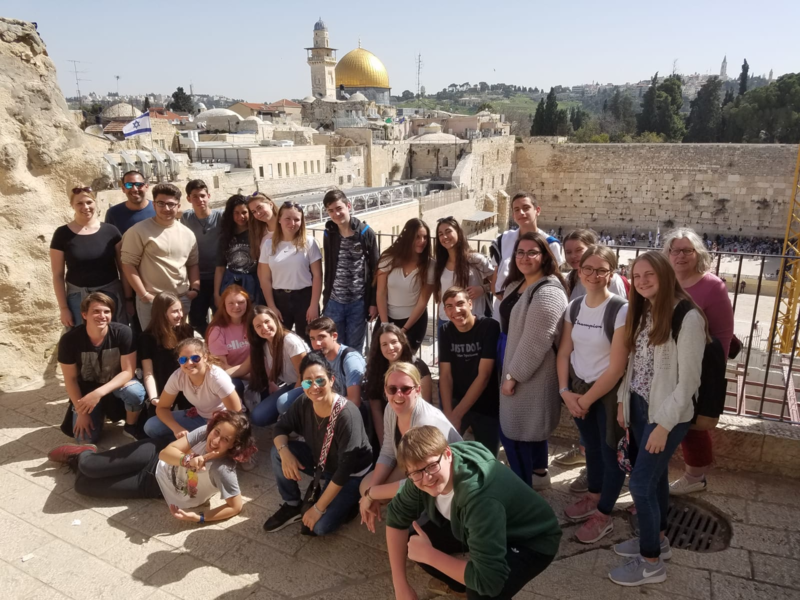 We are Laura and Lisa and we participate in the KJR Israel exchange. To prepare for this exchange we have some meetings. The first one was in February, on the sixteenth and seventeenth in Wemlighausen. For going there, we met at the train station in Kreuztal and went there by bus. After the one hour journey, we first had some time in our rooms. Then, we met to play some games to get to know each other. Some of them were really funny J. Afterwards we had lunch, which was really tasty and then we had some time to do what we wanted. That was something we had very often so we also did stuff with others and got to know them. 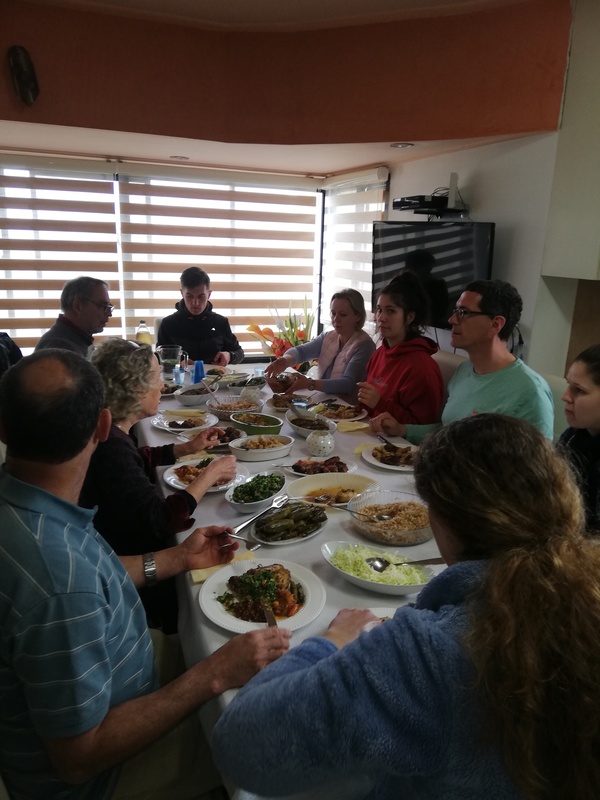 In the afternoon, we talked about Israel and learned new things, because we did a research, the teamers told us a lot and we did a quiz at the end. Before we watched the movie “ The boy in the striped pyjamas” , about national socialism, we had dinner. Later, some of us still sat together, sang and played Truth or Dare. The next morning, we first had breakfast after we got ready. In the following we had to create some videos for presenting our group to our exchange partners. Most of us really liked this task, because one could be creative. After lunch, we had a big break for using all the free time possibilities offered there, like billiards, table tennis and dart. 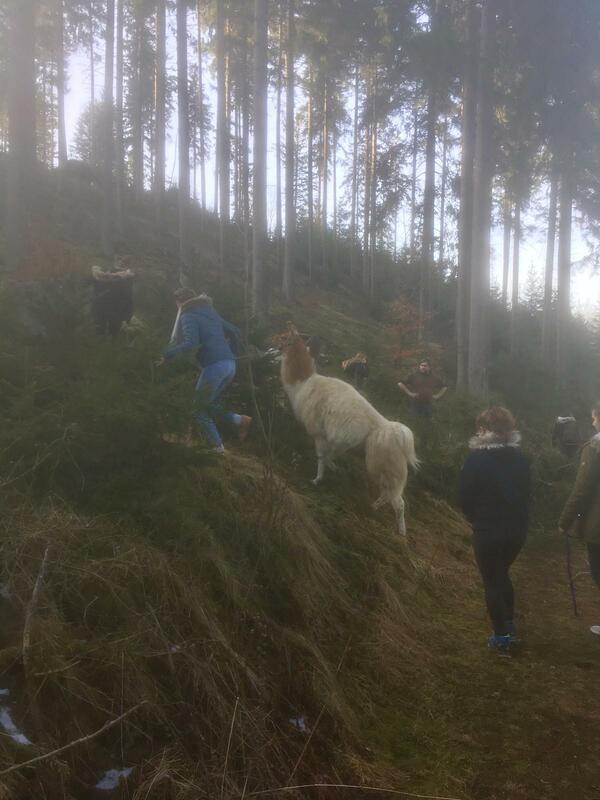 Then, we did something, which was a great surprise, a lama trip. That was a really good ending for our weekend. At the end, we met again and told the teamers what we liked and disliked. Then, we just turned home again, looking forward to the next meeting and being anxious to the exchange. 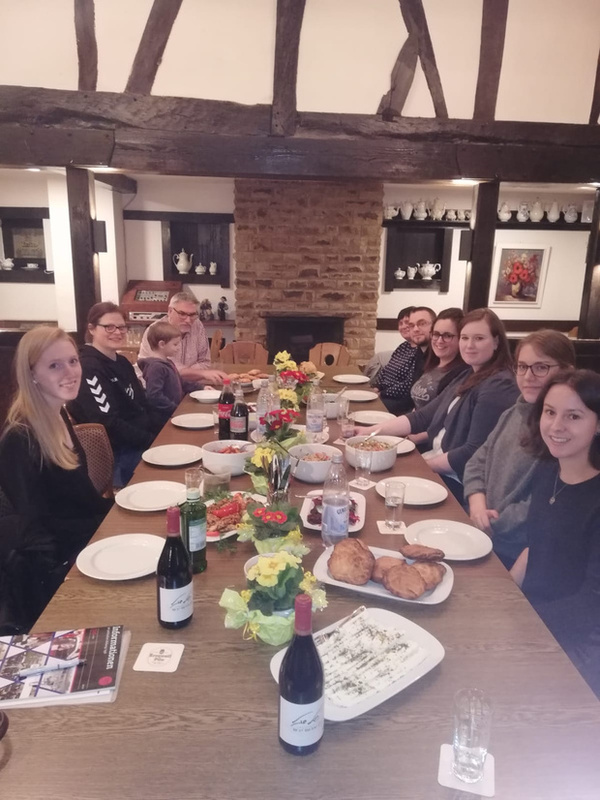 Thanks a lot to the teamers for such a great weekend! We are happy to see you and make activities with you. We are curious to meet you and your family and to see your wonderful country. In school we learnt a lot about Israel, like the culture, food and sightseeings. We are nervous to meet you and your family but we are glad to make this exchange with you. Interspace, was soll das denn sein? Jugendperformancebegegnung, was ist damit gemeint? Hier kommen die Antwoten: Interspace ist eine neue Jugendbegegnungsmaßnahme, die nun an den Start geht. Oder besser gesagt, ins Rampenlicht tritt, denn es wird kreativ und künstlerisch. 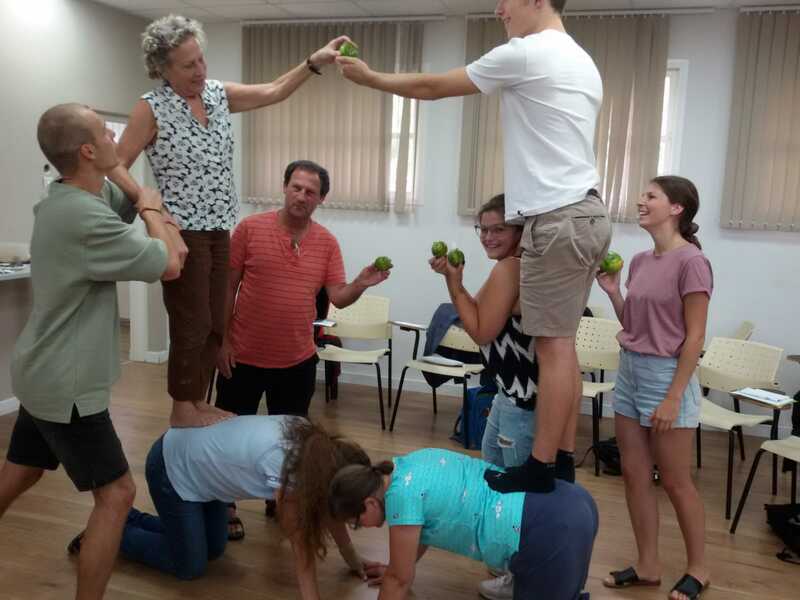 Israelische Jugendliche aus Emek Hefer und deutsche Jugendliche aus dem Kreis Siegen Wittgenstein, die Interesse und Spaß an Theater, Tanz und Musik haben, werden Teil des Interspace, lassen es entstehen und für ein Publikum auf verschiedenen Bühnen sichtbar werden. Der erste Teil des Entstehungsprozesses wird im Oktober mit der Hinbegegnung hier im Kreis starten. 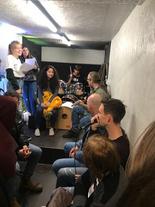 Hier wird gemeinsam mit fachlich und pädagogisch ausgebildeten Workshopleitern aus den Sparten Musik/Tanz/Theater eine Performance erarbeitet. Bis zur Rückbegegnung in Israel wird im digitalen Austausch miteinander weiter inszeniert und geprobt. In den Osterferien 2020, bei der Rückbegegnung in Israel, wird das Projekt gemeinsam auf die Bühne gebracht. Wir alle sind gespannt auf Interspace, eine Maßnahme die Raum bietet, Räume zu schaffen, zu eröffnen und mit Kreativität zu füllen. Wer jetzt so richtig neugierig geworden ist darf sich in unserem Downloadbereich gerne den Flyer und die Anmeldeunterlagen herunterladen ! Anmeldefrist ist der 01. Mai 2019, falls die Plätze nicht schon vorher belegt sind. Viel zu schnell ist er gekommen, der Tag der Abreise. Wir waren nur fünf Tage in Emek Hefen, aber die waren so voll von Eindrücken, das sie sich nach viel mehr anfühlten. Zuerst ging es heute für Barbara und Hans-Dieter um das geplante Kooperationsprojekt „Interspace“. 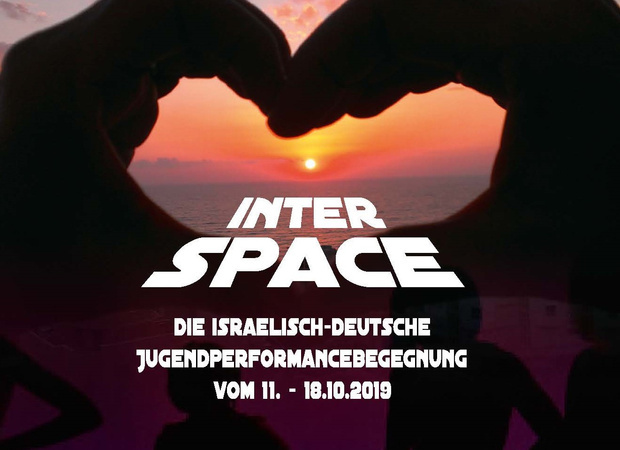 Israelische und deutsche Jugendliche werden unter dem Motto "Interspace" in den nächsten zwei Jahren gemeinsam ein Musik- Theater und Tanzprojekt erarbeiten und es dann in beiden Ländern auf die Bühne bringen. Es trafen sich mehrere Verantwortliche eines Gymnasiums, um das Projekt und die Durchführung vorzustellen. Dabei zeigte sich ein großes Interesse und die Bereitschaft daran mitzuwirken. 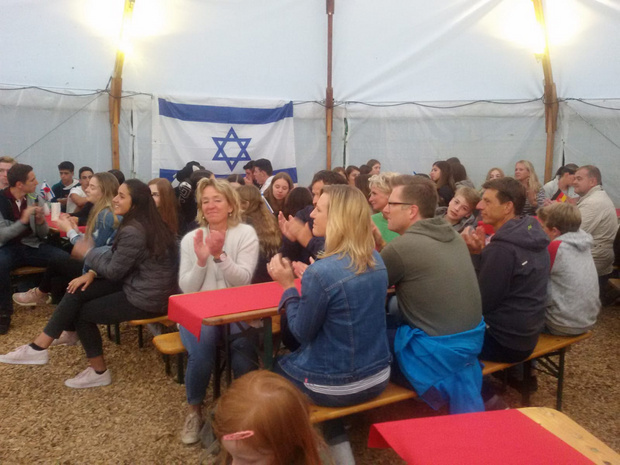 Im Oktober wird dann eine Gruppe von 18 israelischen Jugendlichen in den Kreis Siegen kommen, deutsche Jugendlichen kennenlernen und mit ihnen gemeinsame Ideen entwickeln. 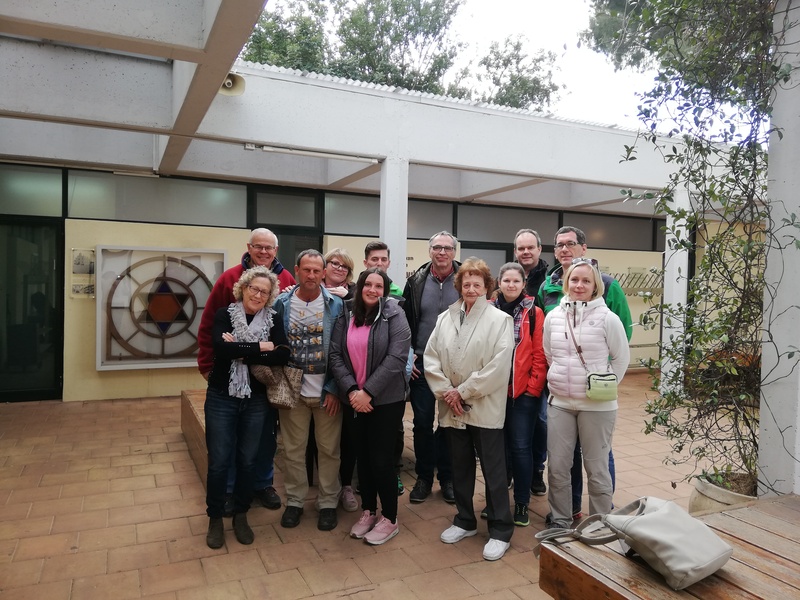 Während diesem produktiven Treffen besuchte der Rest der Gruppe einen botanischen Garten in Emek Hefer. Neben Bäumen aus aller Welt konnte man hier eine Vielzahl an essbaren Blüten bestaunen. Anschließend erzählte uns Shelly in einer Wasseraufbereitungslage einiges über die komplexen Probleme, die die landwirtschaftliche Bewirtschaftung in einer, eher von Wassermangel geprägten Region, mit sich bringt. Ein zentraler Satz von ihr war: „Was nützt es Land zu besitzen, wenn man nicht in der Lage ist, es nachhaltig zu erhalten und weiterzuentwickeln?" Neben der Wasserbewirtschaftung wird in den letzten Jahren auch immer mehr Wert auf Recycling und alternative Energieerzeugung gelegt. Danach stärkten wir uns noch ein letztes Mal mit leckeren Falaffeln, um dann nachmittags wieder den Heimflug anzutreten. Fünf Tage „Israel für Anfänger“, war ein höchst spannendes Erlebnis für uns, und die vielen neuen EIndrücke werden uns noch länger beschäftigen. Einmal Teilen bitte! Fußball! Auch heute hat uns der Regen in Israel nicht verschont. Doch dies hat Christian und mir nichts ausgemacht, da wir von einem Fußballplatz zum nächsten gewechselt sind. Den heutigen Tag widmeten wir dem Grund, weshalb wir eigentlich beide hier sind: Dem Fußball Austausch zwischen Maccabi Bat Hefer und dem SV Fortuna Freudenberg. Der Tag begann deshalb mit einem Fußballspiel der Mannschaft, die diesen Sommer zu uns nach Siegen kommen wird. Wir durften das Spiel von der Tribüne aus beobachten und gerieten somit zwischen die Eltern. Sie haben ihre Mannschaft so kräftig unterstützt und angefeuert, sodass wir nun selber so gut wie alle Spieler beim Namen nennen können. Trotz der tatkräftigen Unterstützung haben sie leider das Spiel verloren. Danach musste erstmal eine Stärkung her und die gab es in einem sehr leckeren Burgerladen. Dort trafen wir auf den Fußballpräsidenten, der die Mannschaft auch mit nach Siegen begleiten wird. 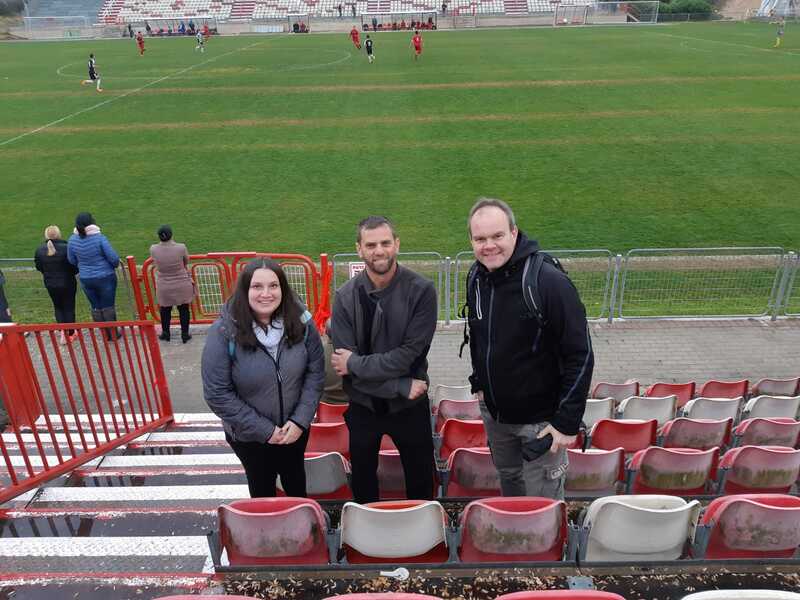 Das zweite Fußballspiel fand in Nazareth statt und verlief erfolgreicher als das von heute Morgen. Und der Rest! 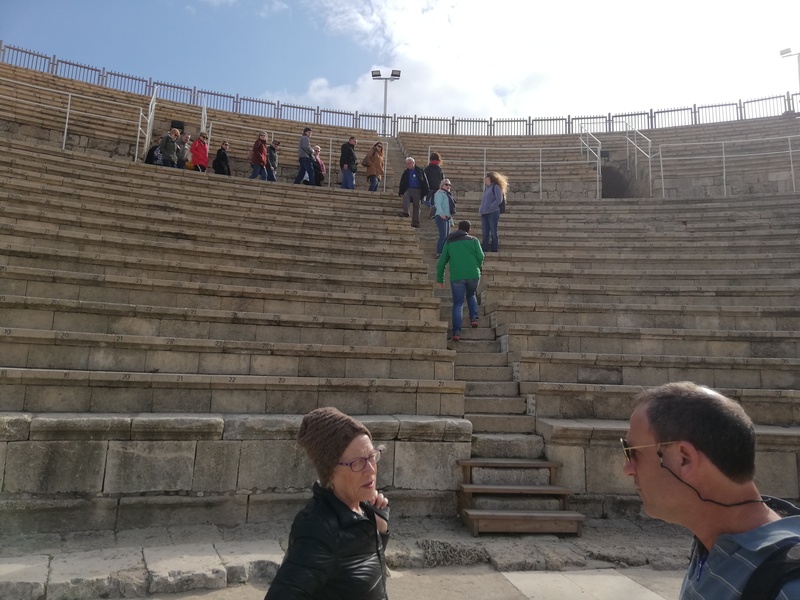 Als Kontrastprogramm zum Israel-Geschichts-Crashkurs der vorangegangenen Tage, der sich vorrangig mit der Entwicklung der Religionen befasste, wurden am heutigen Sabbath die Überreste der römischen Stadt Caesarea besucht. Im Gegensatz zu den in Deutschland bekannten Überresten nördlicher römischer Städte, wie Trier, Köln und Xanten, stand hier nicht die Bedeutung des Limes im Vordergrund, sondern maßgeblich der Handel mit anderen römischen Metropolen. Dieser wurde hier durch einen, nicht nur für die Jahre um Christi Geburt, Hafens immensen Ausmaßes ermöglicht. Er lieferte die Grundlage für eine in vielerlei Hinsicht sehr weit fortgeschrittenen Zivilisation, welche ihrer Zeit deutlich voraus war. Aber auch in der Gegenwart spielt Caesarea eine bedeutende Rolle in der Geschichte Israels, da dort in der näheren Umgebung sowohl das mit Abstand reichste Kibbutz, als auch das ärmste arabische Dorf Tür an Tür angesiedelt sind. Mit ein wenig Wehmut an den Gedanken des morgigen Abschieds geht ein weiterer äußerst ereignisreicher Tag zu Ende. Zugegeben - wir wollten bis zuletzt nicht glauben, dass auch Israel ab und an Siegerländer zu bieten hat. Erst als der Airbus A321 auf der patschnassen Rollbahn in Tel Aviv aufsetzt, war uns klar: Israel kann auch Schmuddelwetter. Aber egal. Wir - das sind Pia, Dina, Patrick, Hans-Dieter und Christian als angehende Teamer - sind gestern mit Barbara vom KJR gen Osten aufgebrochen. "Israel für Anfänger" lautet die Devise, was alles beinhaltet zwischen Kippa und Kibbuz, Hummus und Holocaust. Klingt krass - ist es auch. Zwischen den düsteren Kapiteln unserer eigenen Geschichte stehen herzliche Begegnungen auf dem Programm und das zumeist bei köstlichem Essen, das so manchen Diätplan innerhalb kürzester Zeit zunichte machen wird. Nach Tel Aviv am Anreisetag stand heute Jerusalem auf dem Plan. Mit einem Besuch in der Holocaust-Gedenkstätte Yad Vashem, des Ölbergs, im Garten Golgatha, Klagemauer und mit einer spannenden Führung durch die unterirdischen Gänge entlang der "Western Wall". Aber wie gesagt, nie ohne Regenschirm. Welcher Israel-Reisende kann das schon von sich behaupten...? ...das Motto unseres Treffens mit ehemaligen Austauschteilnehmer*innen hätte besser nicht sein können, denn beim gemeinsamen Zutaten Schnippeln und dem leckeren Duft von besonderen Gewürzen wurden schnell Erinnerungen wach an die Jugendbegegnungen mit Emek-Hefer. 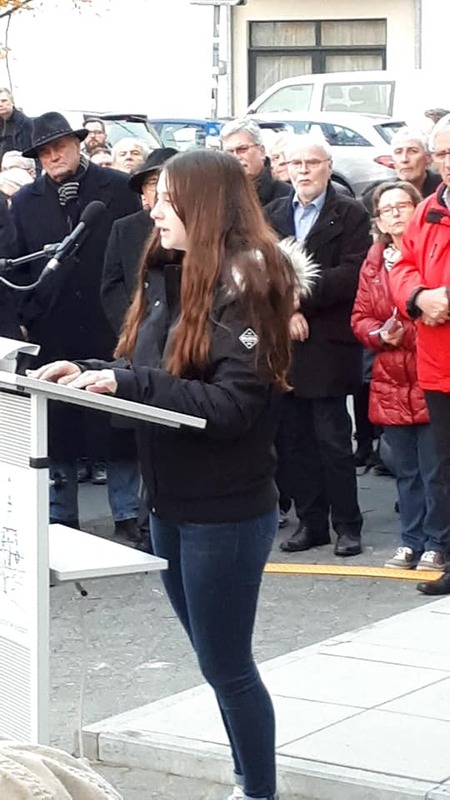 Unserer Einladung zu diesem ganz besonderen Koch-Event waren sieben ehemalige Teilnehmer gefolgt und so gab es am 15. Februar ein reges Treiben in der Küche der „Alten Linde“ in Wilnsdorf. Natürlich wurde israelisch gekocht und genossen. Beim Essen wurde viel erzählt, anschließend wurden alte Fotos angeschaut und über eigene Erfahrungen und Erlebnisse berichtet. Einige der Teilnehmer*innen waren auch nach ihrem Austausch noch einmal in Israel, andere stehen immer noch in Kontakt zu ihren ehemaligen Austauschfamilien. Es war eine tolle Zeit, da waren sich alle einig. Das „Kochevent“ fand zum ersten Mal statt, machte aber Appetit auf mehr. Und so lautete das Fazit bei allen: Das sollte man wiederholen! Lauwarmes Wasser, warme Milch, Hefe und Zucker verrühren und kurz gehen lassen. Mehl hinzufügen und alles zu einem Teig verkneten. Diesen Teig 10 Minuten gehen lassen. Salz und Olivenöl zugeben und lange kneten, anschließend weitere 30 Minuten gehen lassen. Teig in 16 Stücke teilen und zu Kugeln formen, diese noch einmal 10 Minuten gehen lassen. Backofen auf 250°C vorheizen. Kugeln mit geölten Händen zu Fladen drücken, auf dem Backblech verteilen und ca. 6-8 Minuten backen. In einer Schüssel den zerdrückten Knoblauch mit 2 Tl abgeriebener Zitronenschale, 50 ml Zitronensaft, Honig, 1½ Tl Salz, und reichlich Pfeffer verrühren. Das in Stücke geschnittene Huhn darin über Nacht, mindestens aber für zwei Stunden marinieren. Fleisch scharf anbraten, mit der Paprika in eine ofenfeste Form füllen und zehn Minuten in den Backofen schieben, anschließend 10 Minuten ruhen lassen. Marinade mit den Mandeln kurz aufkochen, gehackte Minze zufügen und zum Fleisch dazureichen. 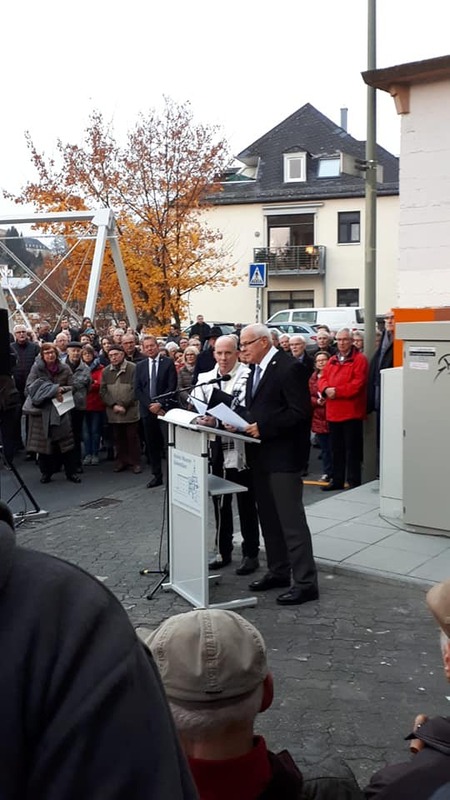 Nachdem der Landrat unseres Partnerkreises Emek Hefer am Mittwoch den 23.01.2019 bereits offiziell von Landrat Andreas Müller verabschiedet worden war, durfte der KJR sich zusammen mit der CJZ am letzten Wochenende über den Abschiedsbesuch des langjährigen Landrats Ran Idan aus Emek Hefer freuen. 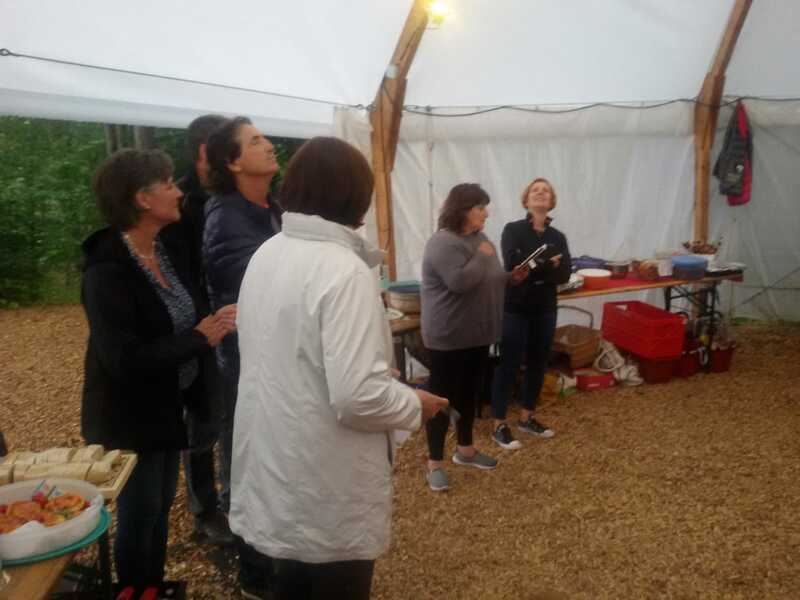 Mit einem gemeinsamen Programm, das von der Besichtigung der Krombacher Brauerei bis zu einem Konzertbesuch im Apollo reichte, erhielten wir die Gelegenheit uns zu bedanken für langjährige gute Zusammenarbeit und Abschied zu nehmen. Landrat Ran Idan versicherte uns, unsere Arbeit weiterhin zu unterstützen und so wurde klar, dass es zwar ein Abschied von einem Landrat, keineswegs aber von dem Freund Ran Idan sein würde. Der Sonntag stand im Zeichen des Gedenkens an den 74ten Jahrestag der Befreiung des Konzentrationslagers Auschwitz. 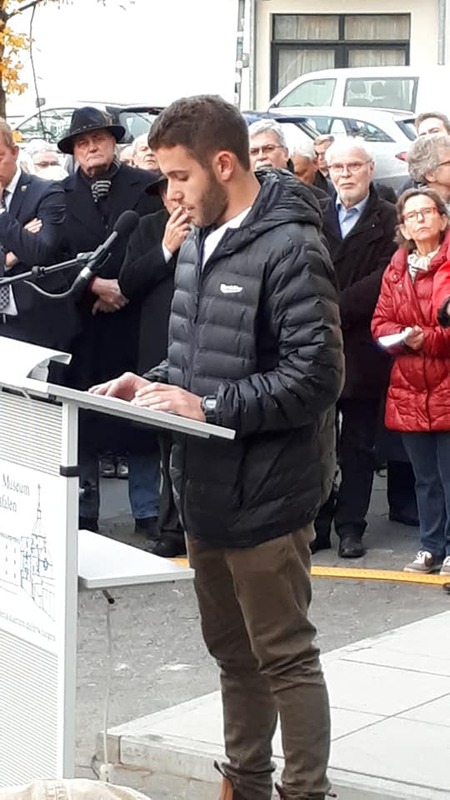 Gemeinsam mit dem Landrat Ran Idan, Yonat Idan und Yoni Scherzer nahmen wir Teil an einer Gedenkfeier im aktiven Museum in Siegen und einem Erinnern in der Stadt Kreuztal. Noch einmal bedanken wir uns hier für die gute Zusammenarbeit und freuen uns bald die neue Landrätin Galid Shaul willkommen heißen zu können. 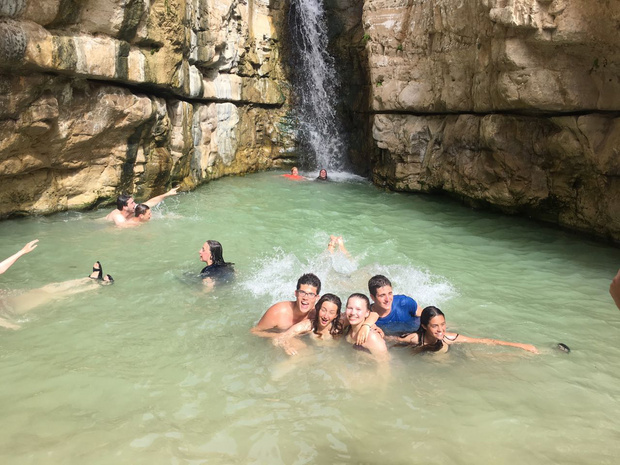 Tamir, Gal und Noa, drei SchülerInnen der Schule Ramot Jam in Emek/Hefer in Israel, die in den Jahren 2017/18 an der Jugendbegegnung mit der GMS Burbach teilgenommen haben, waren erneut mit ihrem Lehrer Yuval und Mitgliedern des israelischen Austauschkomitees zu Gast im Kreis Siegen-Wittgenstein. 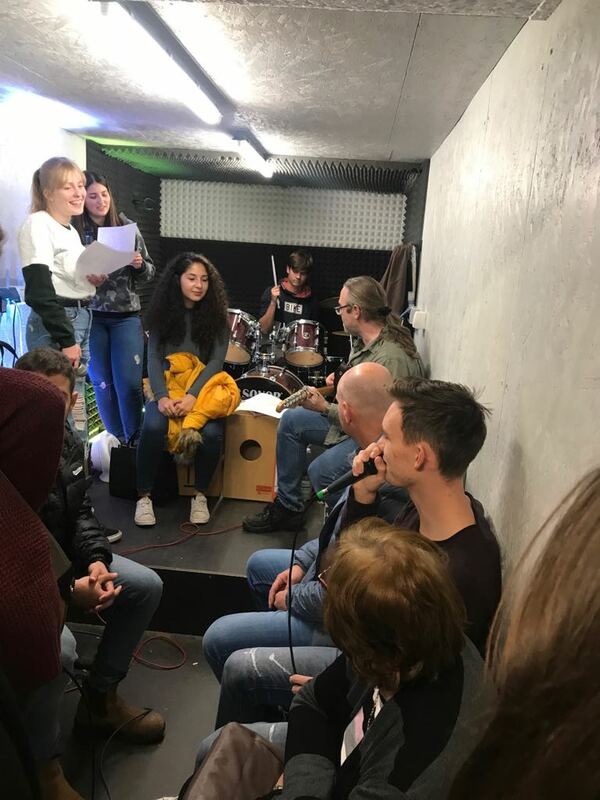 Vom 7.- 10 November standen Begegnungen mit Jugendlichen aus den Städten Kreuztal und Hilchenbach auf dem Programm. 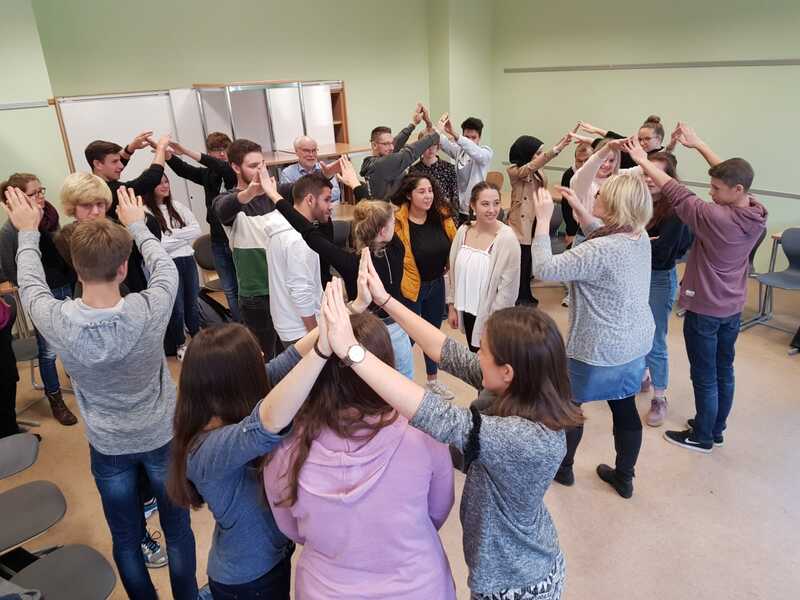 Die KJR Begegnung 2019/2020, mit dem Kooperationspartner evangelische Kirchengemeinde Krombach steht bevor und wer könnte da interessierten Jugendlichen besser ihre Fragen beantworten, als Jugendliche des Partnerkreises. Im Mittelpunkt des dreitägigen Besuchs stand aber das gemeinsame Gedenken. 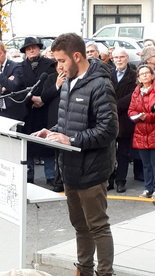 Und so trugen die israelischen Jugendlichen gemeinsam mit Schülern der GMS Burbach, bei der zentralen Gedenkfeier in Siegen, Gedichte auf Hebräisch und Deutsch vor und legten auf dem Platz der Synagoge einen Kranz zum Gedenken an die Opfer nieder. Nach Israel reisen ist immer ein tolles Erlebnis, auch wenn es sich um eine Arbeitsreise handelt. Hart gearbeitet wurde dort auch, von den neun Teamer*innen aus den unterschiedlichen Austauschprogrammen des KJR und den sieben israelischen Teamer*innen, die gleichzeitig tolle Gastgeber waren. Teamarbeit unter Teamer*innen, heißt Konzepte zu erarbeiten und zu diskutieren um die Qualität des Austauschs hochzuhalten, die Transparenz zu erhöhen und die Zusammenarbeit zwischen den Teams beständig weiter zu entwickeln. So wurde in toller Umgebung nachgedacht, bis die Köpfe rauchten, unter anderem auch über ein Schwerpunktthema für die kommenden Maßnahmen. Zentraler Gedanke wird sein, den Jugendlichen zu vermitteln, dass die Vergangenheit ein Teil ihrer eigenen Identität ist und sie wiederum Teil der Zukunft sind. Anpfiff: Die Fußball-Jugendbegegung startet in die erste Halbzeit! 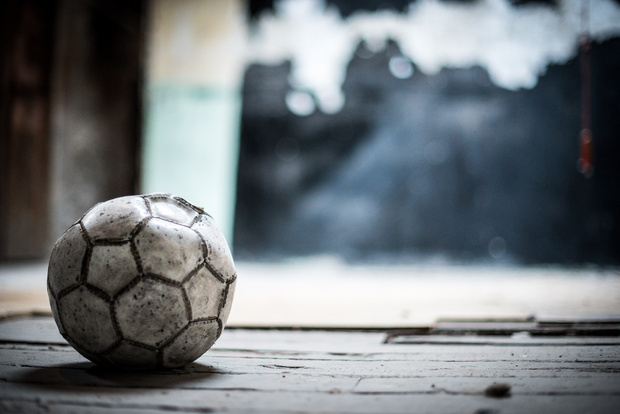 Am 05.09.2018 startet die neue Fußball-Jugendbegegnung mit einem Infotreffen. Dank einer Kooperation zwischen dem SV Fortuna Freudenberg-Büschergrund und dem Kreisjugendring rollt bei einer neuen Jugendbegegnungsmaßnahme in Zukunft der Ball. Die Hinbegegegnung findet im Frühsommer 2019 statt: 22 Fußballspieler*innen aus Emek Hefer in Israel freuen sich schon auf ihren Besuch im Kreis Siegen-Wittgenstein. Die Vorfreude auf eine spannende Begegnung, auf und abseits des Platzes, darf beginnen! Mehr als 1000 Worte ! heute möchten wir mit Euch nochmal den youtube - Link zu unseren Film über den Jugendaustausch teilen, denn manchmal sagen Bilder mehr als 1000 Worte. Und wenn Ihr jetzt richtig Lust auf unseren Austausch habt...bald versorgen wir Euch hier mit den Informationen über das kommende Programm! Farewell and see you soon ! Time flies when you are having fun! One week exchange time passed very quickly and we grew together to an awesome team. And sooner than expected it was time to say goodbey. So we spent our last evening in the „CVJM Bildungsstätte“ in Wilgersdorf. 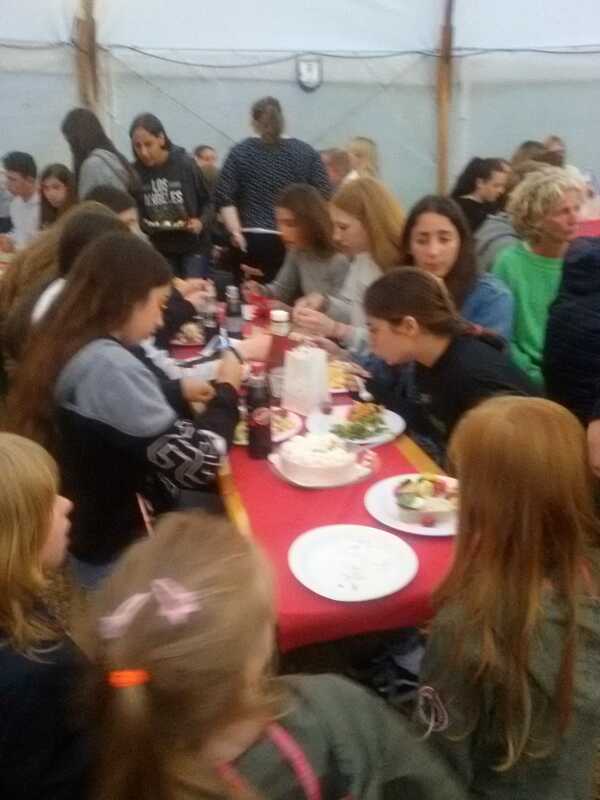 Our Farewellparty took place in a large tent and although it was raining cats and dogs outside, the mood was really on top. Everybody who was involved in the handball youth exchange, host families, teamer etc. took part and enjoyed the BBQ and the nice buffet. 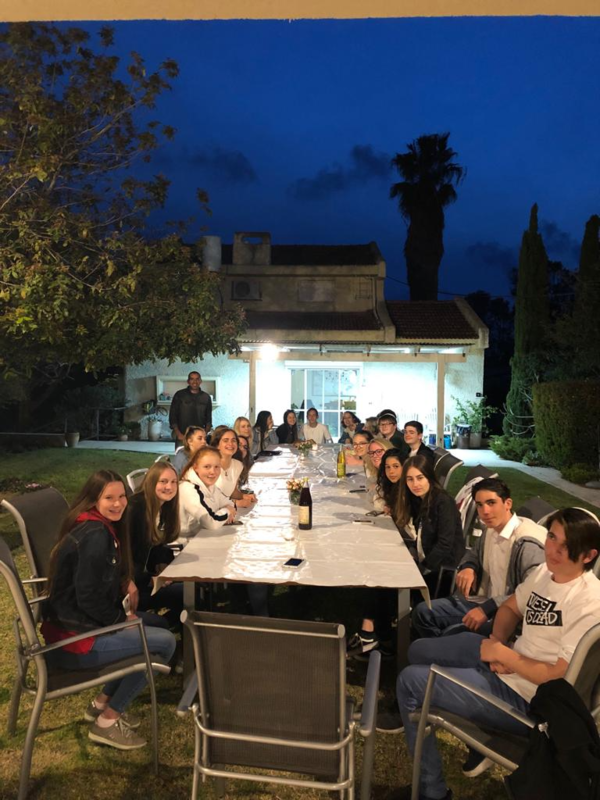 During the last week the german exchange members learned a song from the israeli group and we enjoyed the feeling of solidarity while presenting it together. 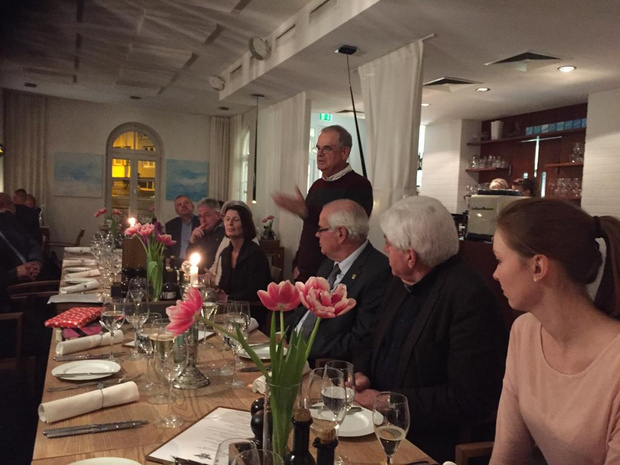 Now it´s time for a summary: It was a very intensive but also too short time here in Germany. 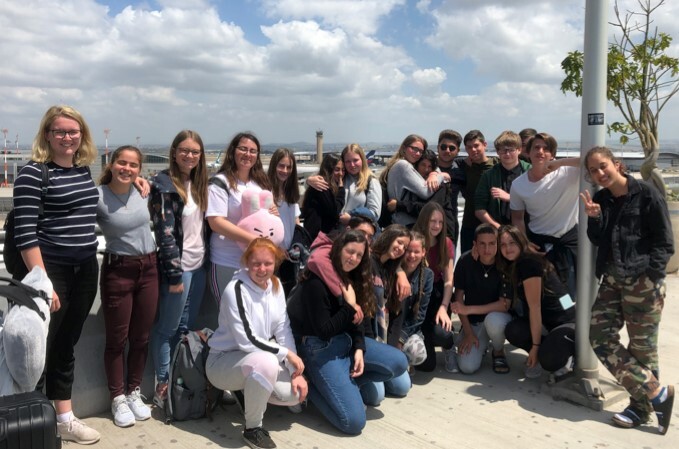 We can´t wait to meet as a team in israel again ! Sunday, 8 July – Sporting time ! 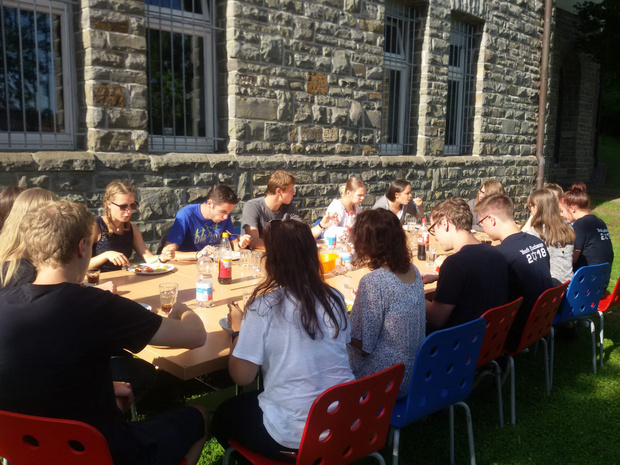 After the first half of our handball youth exchange is already over, the whole Sunday meant to be handball time. 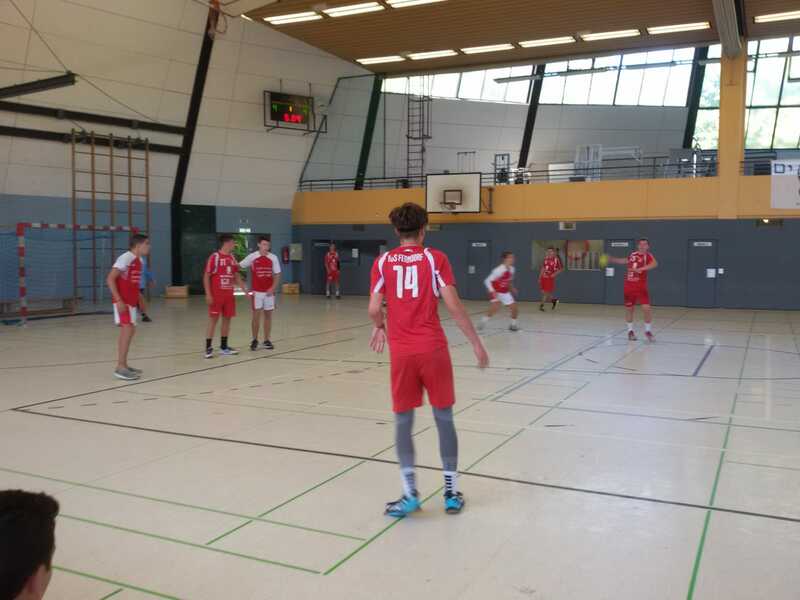 We all took part in a handball tournament at Rundturnhalle Niederschelden. 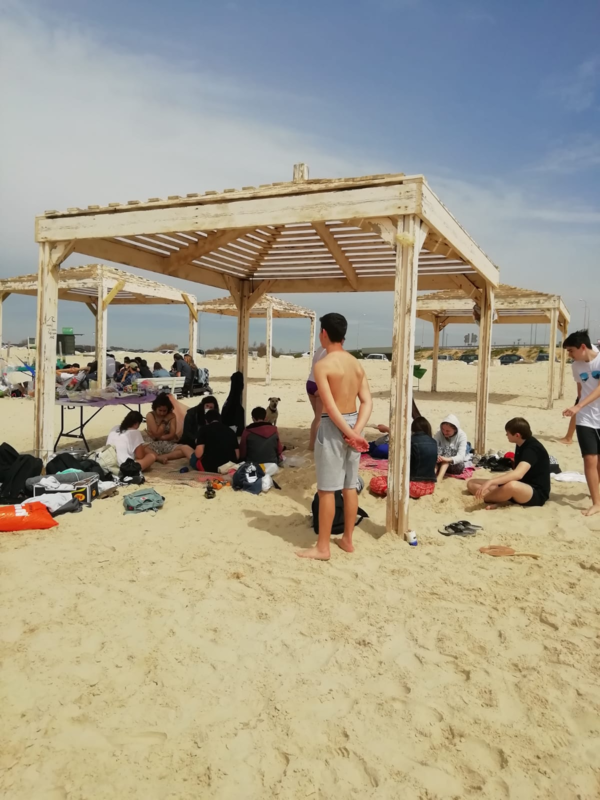 The israeli boys set up a separat team, while the girls joint the RSV girls team. Besides a lot of fun we really had the chance to experience and to strengthen our new fellowship by sharing our hobby. Tomaten einritzen und 1 Minute in kochendem Salzwasser blanchieren, abschrecken und die Haut abziehen und anschließend klein schneiden. Zwiebeln und Knoblauch fein würfeln. Paprika putzen, vierteln, entkernen und fein würfeln. Kreuzkümmel, Koriander, Kardamom, Zimt und Chili in einer großen Pfanne ohne Fett rösten, bis die Gewürze zu duften beginnen, und auf einen Teller geben. 3 El Öl in einer Pfanne erhitzen, Zwiebeln und Knoblauch darin glasig dünsten. Paprika zugeben und 5 Minuten weich dünsten, Paprikamark zugeben und kurz mitrösten. Tomaten, Gewürze und Paprikapulver zugeben. Mit Salz und 1-2 Tl Zucker abschmecken, bei mittlerer Hitze 30-40 Minuten zu einer dicken Sauce einkochen und eventuell erneut abschmecken. 4 Mulden in die Tomatensauce drücken. Eier einzeln aufschlagen und je 1 in die Mulden geben. Eiweiß jeweils vorsichtig in die Sauce rühren, dabei aufpassen, dass das Eigelb nicht verletzt wird. Die Eier in 10-15 Minuten bei mittlerer Hitze stocken lassen, Pfanne eventuell zudecken. Inzwischen das weiße und hellgrüne der Frühlingszwiebel in feine Ringe schneiden. Petersilienblätter von den Stielen zupfen und fein schneiden. 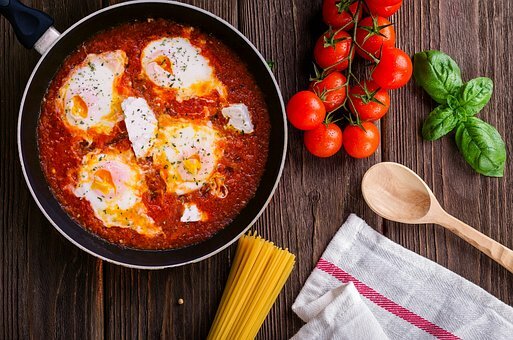 Shakshuka mit Frühlingszwiebeln, Petersilie und Schwarzkümmelsaat bestreuen. Mit dem restlichen Olivenöl beträufelt servieren. Dazu passt Baguette oder Fladenbrot.